Minseo (or Min) may be a newcomer in the Canadian hairstyling scene, but she’s no newcomer when it comes to her extensive knowledge of hair. 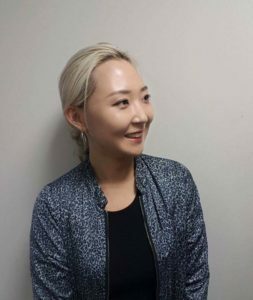 Born and raised in South Korea, she started her career in hair styling at the age of 16 as a competitive hair stylist and has won numerous awards in Korea. Min obtained her Bachelor of Design, and made her move to Canada to broaden her experience and further her study in this art. There is not a day that goes by when she doesn’t display her passion and love for the industry. Min makes hairstyling look easy, much like a painter or any artist; most artists use a palette and brushes whereas she uses pairs of scissors and brushes to craft an art on hair using her extraordinary hair-cutting techniques. She has the natural ability to take her vision and bring it to life! “I find enjoyment seeing a smile and excitement when I help clients find their right hair. To me, this is more than work; it is a never-ending dream that I want to grow up with”.